The cooler weather brings with it the change of seasons, holiday festivities and an end to summer outdoor activities. This means that your misting system will need to be properly winterized in order to prevent damage to the system and preserve its integrity. Fortunately, this is not as hard as you may think. Essentially, the only thing you have to do is remove any excess water or restrictions in the pipes so that it does not cause the pipes to freeze and damage the pump and tubing. Here are the steps you will need to take to properly maintain your misting system this winter. ·First, turn off the water supply that runs to the mist pump and unplug the timer, if applicable. · Then remove the tubing from the inlet and outlet on the mist pump and let the mist heads drain. Some people prefer to leave the mist heads unattached for the majority of the winter season. Finally turn on the mist pump. If there is not a low-water safety switch on the pump, the motor will run until all of the excess water very quickly. However, it the safety switch is included, the motor will not run because the water level is too low due to the water supply disconnection. In this case, use the inlet solenoid valve to purge the pump using compressed air. Force compressed air into the inlet and outlet ports until the water has drained. This only takes a few seconds. If you do not have any compressed air available, you can also rotate the pulleys on the drive pump or rotate the fan near the back of the motor on the direct drive pump to allow excess water to leave the bare pump. When you are done, add RV antifreeze to the hoses and lines. Do not use automobile antifreeze – only non-toxic RV antifreeze. Automobile antifreeze is extremely toxic to animals, while the kind of RV antifreeze used in RV septic and water tanks is safe for use (still keep away from animals). Store all components removed from the system in a warm place, such as in your home. Before storing the items for winter, it is a good idea to clean each part and check for leaks. Change the timer batteries. It does take quite a bit of time to clear the misting system of excess water but it is absolutely necessary for the machine to continue to function properly. When summer starts, simply reconnect all the tubing and insert the nozzles to begin using the system again. If you follow these steps and the steps in your owner’s manual, you will lessen the risk of your system breaking down just as the weather heats up. If you are ever in doubt about maintaining your individual misting system, consult your plumber or the manufacturer. 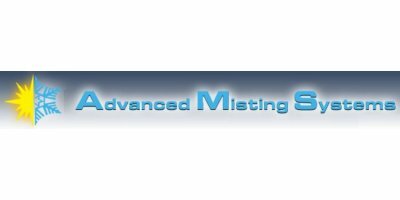 Advanced Misting Systems offers a variety of misting systems to its customers. Whether you are looking to keep cool, or looking to control dust, humidity or odor, AMS has you covered. AMS offers evaporative coolers, outdoor cooling fans, swamp cooler and mist cooling systems. The company also offers agricultural fans as well. No comments were found for Winterizing Your Misting System. Be the first to comment!